Manga Artist Paper - 50 Sheet Packs - Loose Sheets - This paper is made especially for Manga artists. It is excellent for pen & ink, technical pens, and markers. 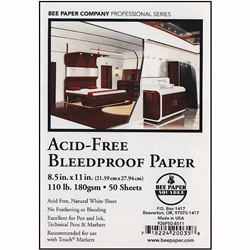 The paper is designed so that ink and markers will not feather or bleed. The smooth surface is ideal for detailed work, and has excellent erasing qualities.